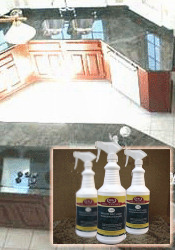 Shining & Cleaning Granite Counter Tops is easy with this KIT!!! Beautify, protect and clean your granite counters, stone vanities, ledges, shelves, walls AND even your stainless steel with this care kit. Plus you'll save money. Clean your Granite counters with a daily spray cleaner ... then, enhance and maintain the beauty and shine with a stone polish. TWO quartz of daily cleaner. One Quart of stone polish! These products work great for your Granite care AND they're safe to use on ALL Natural Stones. Cleaning granite counter tops is quick and easy! AND, it's safely used on ALL Natural Stones and surfaces. This stone polish restores slightly worn down surfaces to like new condition! Don't worry about preparing food on your polished granite countertop. It's SAFE! The maintenance care kit is the very best product line available to the end user of Stone for the cleaning and care of granite counters, marble vanities, stone shower walls AND all other polished stone. Not for floors. it brings out the deep rich colors of our Blue Pearl counter tops like we've never seen before! A million thanks for recommending this product! It's so easy to use and provides simply daily care to our granite and it keeps the granite looking spotless! We are 110% satisfied with your products and your knowledge of granite !!!!!!! !